Full-length mink coats, a new Mercedes Benz 4matic or Range Rover Evoque and a tastefully furnished apartment or mansion in highbrow Banana Island, Victoria Island, Lagos, makes falling in love with an older man a.k.a Sugar Daddy, pretty easy and so much fun for a young lady. Add to the mix, unrestricted access to gold and platinum credit cards and the innumerable possibilities presented by the sugar daddy’s ownership of a private jet, and you have a gleeful, girly paramour whose joy knows no limits. A private jet is no doubt a game-changer, it presents the girl, lady or sugar baby, if you like, cozy prospects, like the possibility of flying by private jet to Europe just to spend some days in an exclusive sauna or salon getting her hair and nails done. One Lagos sugar baby even has a bank account set up where her much older companion deposits $10,000 a month to cover “incidentals” like Chanel bags, Hermes belts and the latest Louboutins. Although some would readily cite falling in love truly with her rich old lover but that is simply one defense that could hardly stand the test of doubts and intolerant criticisms by less permissive and conservative sections of the contemporary society. Nonetheless, it is noteworthy that the rules of dating and marriage are changing and Nigerian ladies would not be caught napping in the global dash for the sugar daddy with the deep pocket. Interestingly, however, Chief Emmanuel Iwuanyawu, the publisher and founder of Champion Newspapers, owner of Iwuanyanwu Nationale FC and a People’s Democratic Party, PDP, stalwart, is over the moon as you read. You would recall that in September 2013, Chief Iwuanyanwu got married to 26-year-old Frances Chinonyerem Enwerem. He is 72. 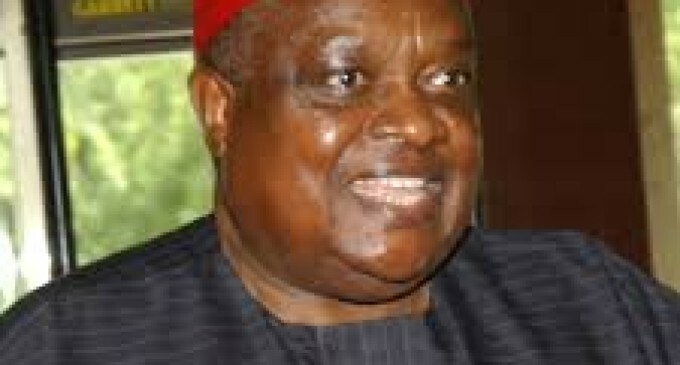 Chief Iwuanyanwu decided to remarry after his wife of over 40 years who bore him eight kids died in 2011. Now, Frances is about to put to bed. She is presently in America and Chief, we hear, will be travelling out of the country to stay by his wife’s side and offer her comfort as she undergoes labour to deliver their baby. Comment…Lara you’re very stupid for that report, if Chief does not get her pregnant are you the one to do that? Look for something else .